Just as it seems unlikely that the world will anytime soon converge on a single, common language (Esperanto failed), it is also unlikely that 'last-mile' electrical distribution systems will agree on a common voltage and frequency standard. In both cases, local implementations are so entrenched that a wholesale realignment would be prohibitively expensive in terms of both resources and finances. The global nature of all aspects of industrial, commercial, and consumer products has necessitated that accommodation be made for all existing systems, and that object has largely been achieved. Generally, most of North and South America use 60 Hz, while nearly everyplace else uses 50 Hz. 60 Hz has the advantage of requiring smaller power supply filter capacitors that required at 50 Hz. The following tables present a compilation of the plethora of voltages, frequencies, and plug/receptacle types to be dealt with. There are 12 plug types, 2 frequencies, and 14 voltage combinations. Fortunately, not all combinations are used (2 x 12 x 14 = 336). Thomas Edison's DC distribution failed because it was not efficient over long distances, requiring many local generation sites. Maybe the growing number of local wind and solar PV cell sites will bring DC back into style. Doing so eliminates the hugely expensive requirement for AC inverters and distribution phase synchronization. The disgustingly large and rapidly growing amount of inverter EMI could be greatly reduced with DC. The following information was obtained by the U.S. Department of Commerce International Trade Administration's open source publication titled, "Electric Current Abroad," dated February 2002. If you have a critical application, please seek the most up-to-date information from local electrical service utilities rather than relying on this information. To assist U.S. manufacturers, exporters and individuals living or traveling abroad, this publication lists the characteristics of electric current available and the type of attachment plugs used in most countries. It is an update of a similar handbook published in 1991. The tables indicate the type of current (alternating or direct current), number of phases, frequency (hertz), and voltage, as well as the stability of the frequency and the number of wires to a commercial or residential installation. This information pertains to domestic and commercial service only. It does not apply to special commercial installations involving relatively high voltage requirements or to industrial installations. 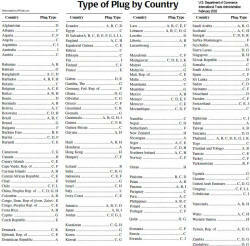 For most countries listed here, two nominal voltages are given. The lower voltages are used primarily for lighting and smaller appliances, while the higher voltages are used primarily for air conditioners, heating, and other large appliances. Travelers planning to use or ship appliances abroad should acquaint themselves with the characteristics of the electric supply available in the area in which the appliance is to be used. In some cases, a transformer may be used to correct the voltage. However, if the appliance requires exact timing or speed and if the frequency of the foreign electricity supply differs from the one the appliance was designed for, it is advisable to use an appliance designed for the foreign frequency since auxiliary equipment to change frequency is bulky and expensive. Some foreign hotels have circuits providing approximately 120 volts which allow guests to use electric shavers and other low-wattage U.S. appliances. The information presented here was compiled over a period of months from a large number of sources. Consequently, there is some possibility of errors or omissions for which the Department of Commerce cannot assume responsibility. In addition, this information should not be taken as final in the case of industrial or highly specialized commercial installations. It would 4 Electric Current Abroad be impossible for the Department to maintain complete data on every foreign industrial installation. For special equipment for commercial use or heavy equipment for industrial use, the current characteristics for the area of installation should be obtained from the end user. The 1998 edition was prepared by the Trade Development unit in the International Trade Administration, U.S. Department of Commerce. The information was compiled by John J. Bodson, industry specialist in the Office of Energy, Infrastructure, and Machinery. Editing, desktop publishing, and production were done by Rebecca Krafft, of the Trade Information Division of the Office of Trade and Economic Analysis. The cooperation of various government and private agencies in providing data is gratefully acknowledged. Special thanks go to the U.S. Foreign and Commercial Service of the U.S. Department of Commerce and the Foreign Service of the U.S. Department of State. Questions about the content of this publication should be directed to the Energy Division in the Office of Basic Industries, (202) 482-4931. Type of current: a.c. indicates alternating current; d.c. indicates direct current. Frequency—Shown in number of hertz (cycles per second). Note that even if voltages are similar, a 60-hertz U.S. clock or tape recorder will not function properly on 50 hertz current. Number of phases: 1 and 3 are the conventional phases that may be available. Nominal voltage: The term nominal voltage is used to denote the reported voltage in use in the majority of residential and commercial establishments in the country or city. Direct current nominal voltages are 110/220 and 120/240. The lower voltage is always 1/2 of the higher voltage. On a direct current installation, the lower voltage requires two wires while the higher voltage requires three wires. Alternating current is normally distributed either through 3 phase wye (“star”) or delta (“triangle”), 4-wire secondary distribution systems. In the wye or star distribution system the nominal voltage examples are 120/208, 127/220, 220/380, and 230/400. The higher voltage is 1.732 (the square root of 3) times the lower voltage. In a delta or triangle system, 110/220 and 230/460 are examples of nominal voltages. The higher voltage is always double the lower voltage. The higher voltage is obtained by using 2 or 3 phase wires and the neutral wire while the lower voltage is the voltage between the neutral wire and one phase wire. The higher voltage may be single or 3 phase while the lower voltage is always single phase and used primarily for lighting and for small appliances. Type of attachment plug in use: Attachment plugs used throughout the world come in various forms, dimensions and configurations too numerous to describe in this report. 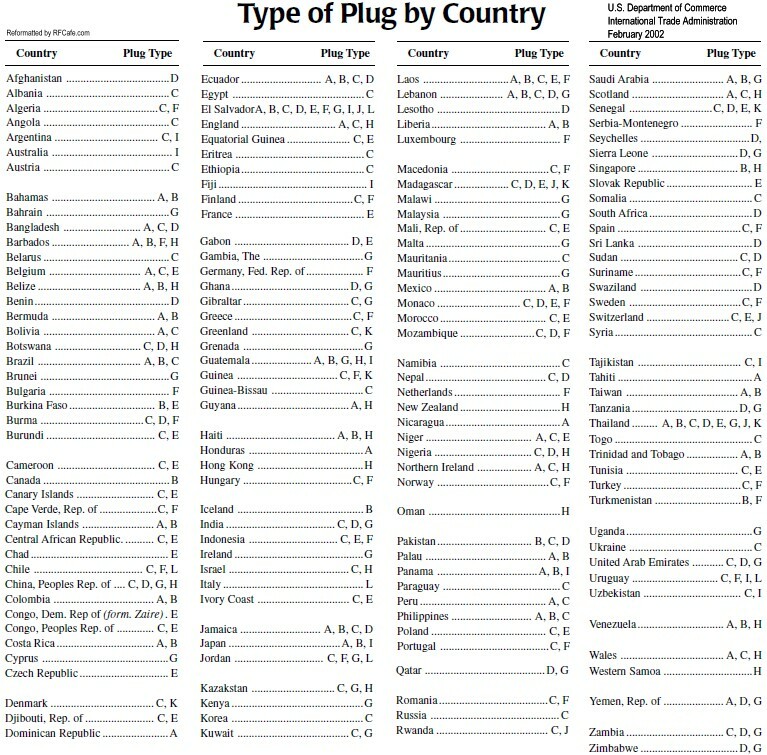 This report does, however, attempt to point 6 Electric Current Abroad out the basic and most commonly used types of plugs by country. Adapters may be purchased to change from the American plug type to other types. Number of wires to the consumer: The number of wires which may be used by the consumer is shown. Normally, a single phase, 220/380 volt system or 127/220 system will have two wires if only the lower voltage is available (one phase wire and the neutral). It will have three wires if both the higher and lower voltages are available (two phase wires and the neutral) and where three phase motors will be used, four wires will be available for the higher voltage (the three phase wires and the neutral wire). Frequency stability: “Yes” indicates that the frequency is stable and that service interruptions are rare.